You have until 8 pm EDT on Monday, August 6 to submit your answers. Use Trivia in the subject line and send your answers to joparente.saintsdrumcorps@gmail.com. Again: prizes, prizes -- we have no prizes other than the fame and glory associated with being mentioned in Saints Scribblings! A quick update again this week -- Kathy Boumpani (Feretich) found us over the weekend (thanks to her husband)! She's posted some info on the Where Are They Now page of www.saintsdrumcorps.com. Welcome home Kathy! 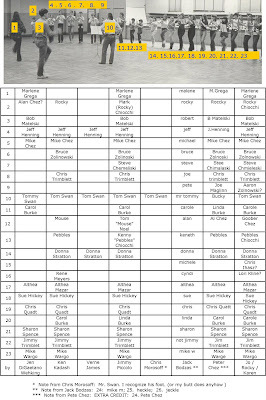 We'll stick with a list by year again this week ... here are the names of 10 members who are not yet connected to www.saintsdrumcorps.com. They all marched in 1974, and in many cases, before or after that year. Donna Stratton (Horn Line) -- Donna found us on September 30, 2007! Know how to reach anyone in this week's Monday MatchUps? If so, e-mail me at joparente.saintsdrumcorps@gmail.com. Thanks! First, on Polls: We have something new to try out on the home page of www.saintsdrumcorps.com! Every Friday (give or take), we'll have a new poll question on the home page, just below the slide show. You can vote once every 24 hours, so vote early and vote often! If you have some ideas to submit for poll questions, send them along to saintsdrumcorps@gmail.com. BTW, if you posted your vote here in Saints Scribblings earlier today, you need to vote again out on the Saints site. Sorry for the inconvenience! Next, on Travels: It's been really great seeing how many of us have had the chance to stop in and visit with others while traveling outside the Saints Metropolitan Area. I also imagine some of you who now live outside the area might be back here at some point over the next few months -- let us know, and we can arrange for a quick gathering at the Menlo Food Court or other location of your choice! Finally, on the Reunion: With summer travels, we won't be trying to gather anyone for a planning meeting until sometime later in August. We'll keep you posted. In the meantime, if you're hoping to be part of the Planning Committee, let me know at joparente.saintsdrumcorps@gmail.com if there are certain dates / weeks in August that are better (or not good) for you. For those of you who share my month, HAPPY BIRTHDAY ALL YOU JULY BABIES! July is a big birthday month for the Parentes, and based on those I know, it is for the Saints as well. I twisted Rocky's arm to create a Members Birthday List out on the Where Are They Now (WATN) page of www.saintsdrumcorps.com. I know he'll LOVE to get e-mails from each and every one of you about your birthday (we're not posting years -- not to worry!). In case you haven't sent in your WATN info yet, this would be a good time / excuse to do so. What caught my attention is how much the current edition of Anaheim reminds me of when they came east and marched in our Music in Splendor evening show in July 1971 ... I can still picture myself standing at the chain link fence at Woodbridge HS, my jaw dropping as I watched their incredible color guard. They placed first that evening with an 84.something, two full points above Blue Rock and its Baby Elephant Walk (another favorite of mine). Back then, Anaheim opened my eyes to what the Saints could indeed become. I really don't think I understood that we could grow to excellence before that moment. Seeing them back on the field, I can't help but wonder what it would take (starting with the energy to get back in shape!) for us to be on the field again in our blue and gold cadet uniforms. No offense to those who marched in 1977, but orange and black just aren't me! It would be nice to just snap my fingers and make it happen ... not sure I have the stamina to actually do it! Out in our Guest Book today (www.saintsdrumcorps.com), Goober had a simple question for all of us: "Hey Gang, enough parade corps talk. When's the next SAINTS get together?" The first step was 6 weeks ago -- keep your eyes open for the next one as the summer progresses! I've included the best guesses from me, Karen, and Rocky in the far-right column -- again, we're doing group guessing! I also used Althea's Music in Splendor program from 1971 -- amazingly, she had written into the program roster which horn each person played that season, as well as who quit and who joined. Thanks to everyone who participated! Without your interest, there's no sense in doing any of this stuff. If you click on the image, it should enlarge. If it doesn't and you want the PDF version of the results, feel free to contact me at josaints.saintsdrumcorps@gmail.com. A quick update: Glen Hill (Monday MatchUps from July 9th) is now connected -- welcome home, Glen, and thanks to Kenny Kadash for reaching him for us! Glen is in Los Angeles and will be posting his contact information on the website shortly. Here's a bit of a different twist on Monday MatchUps -- by year instead of section. Here are the names of 10 members who have not yet connected to www.saintsdrumcorps.com. They all marched in 1975, and in many cases, before or after that year. Kathy Boumpani (color guard) -- found us on July 28! Know how to reach anyone in this week's Monday Matchups? Let us know by e-mailing me at joparente.saintdrumcorps@gmail.com. Thanks! With thanks to Maureen for bringing my camera back from her parents' house, I've now uploaded a current picture of Uncle Tony and Aunt Lorraine in Saints Stories ... check it out by clicking here! What a day I had yesterday -- the highlight, for sure, was having lunch with Uncle Tony and Aunt Lorraine Fastuca! Check out the interview in Saints Stories. Been out of town for about a week and a half -- apologies to my daily readers! Question posted by Chris: I know that a presentation of the national colors was mandatory once upon a time and corps would use other flags too (Their sponsors, their state, ect. ); but what did they do with the flags after the shows got into full swing? Was there somewhere for the honor guard to set them down or did they just continue to march around with them somewhere off the field? The answer to this isn't as simple as it sounds, because the rules changed a few times over the years ... as did the organizations that enforced the rules (local circuits vs AL vs VFW vs DCI vs DCA vs RCA ad infinitum). For most of my experience (late 60s to 1976), the Colors Section required at least 2 members comprised of the National Flag and someone carrying a weapon (rifle, sabre, pistol). Under some rules, a Sponsor Flag (AL, VFW) was also required. This sometimes required an additional weapon, but mostly not. The Flags were never abandoned -- translation: they were carried in a sling or posted with the bearer directly behind. In a lateral line, the National Flag was always to the right of all other flags (measured by the direction of its bearer), and the weapon had to be within a certain distance at all times (I believe it was 4 feet front-back-side, and never separated unless by another weapon, but don't have quick access to any rule books right now). In addition to the lateral line rule, there was also a forward-back rule, which meant the National Flag always had to be in front of (or in an equal line to) all other flags, measured laterally. Finally, the National Flag could be no lower than any other flag on the field at any time, and could be of equal height. This measurement changed from "when in use," (meaning that the tallest member of the guard had to bear the flag or use a taller pole within spec size) to "when measured at posting," which opened up the world of flag work to tossing, arm extentions, etc. Keeping all this in mind, the Colors Section could only remain stationary for certain amounts of time, and marking time was usually a requirement of that. This meant that the Colors Section had to stay within the boundaries of the fields or floor and move from corner to corner (or wherever) without violation of the side-to-side and front-to-back lateral lines by members of the Flag Line marching and turning directions all over the place. The "safest" positions were facing diagonally into a corner (no flags could get in front or to the right) or facing forward along the sideline in a position furthest right along the boundary (no flag could get to the right). Changing directions when a Sponsor Flag was in presence was a bit tricky, and usually required column or pivot moves. Every time we designed a new drill (corps or winter / summer guard), we would have a couple of the Timing and Penalties Judges from the local circuits come in to look over everything strictly from a T&P perspective. I feel like I just channeled my dear and great friends Walter Kelly and John Collum in spelling all this out ... thanks for helping me relive this memory! Each Monday for the time being, Saints Scribblings will be devoted to looking for members who have not yet connected to www.saintsdrumcorps.com. Glen Hill - found by Kenny Kadash! Glen called the hotline on July 23, 2007. Bob Schwartz - Bob found us in time for the November 9, 2007 reunion! For those of you who will be there, have great fun! Don't forget to spread the word about www.saintsdrumcorps.com and the reunion survey. Business cards with the URL are out on our home page and the Alum Assn page (look for the June 20th entries). Do you still go to junior shows? Let the rest of us know what it's like! Either post a comment here in Saints Scribblings or out in the Saints Guest Book. Either way, we're looking forward to hearing from you. When your morning starts with the surprises mine did, it's bound to have a great impact on what the rest of the day is bound to bring. Many of us out there have morning habits. Rocky, our webmaestro extraordinare, needs his coffee to kickstart all his brilliant creativity (I know this only because he told me!). For me, I start with decaf iced tea and a freshly made waffle topped with cinnamon, followed closely by booting up my computer for the day. BTW, if you haven't yet made the leap to Internet Explorer 7, do so! IE7 allows you to have all your Internet windows neatly tabbed across your screen for easy access ... sorry, I digress! Anyway, back to the story. Each morning, the first things I open on my computer are my various and sundry e-mail programs (another long story on why I use more than one), the Saints Guest Book on www.saintsdrumcorps.com, and a utility program or two. Starting with the Guest Book, I see an entry about how someone is grateful that the site has allowed her to reestablish her Saints relationships. Next, I open a piece of mail addressed to me and a couple others saying how thankful he is that the site has allowed him to connect with certain folks that might not have been possible otherwise. The THANK YOU that both the messages shared with me on a personal level brings tears to my eyes, a belated birthday gift to be sure. It's not the first time this has happened since the site has been up, but the messages reached me at a time when I really needed to hear them. Priscilla, Pete, and all of you who have taken the time to express your thanks to me and others associated with the website, YOU'RE WELCOME, and THANK YOU for inspiring today's Saints Scribblings. Do for someone else what was done for me today -- surprise someone with a simple way of expressing your thanks. You'll be a Saint for doing it! A couple of days ago, I spent a few minutes chatting with a former St Mary's schoolmate. We talked about the SMHS Drill Team for a bit -- she mentioned how she always wanted to march with them because they wore those "cute little white boots." Rose, those boots might have been cute, but trust me -- having worn them my first few years in the Saints, they were not on my Top Ten list of good marching footwear! I think I still have a couple of faint scars from where the top edges ripped my legs to shreads ... despite the blisters and pain, I still wouldn't have traded the experience for the world. These days, 4th of July finds me, Karen, and our family and friends gathered at the "Big Yellow House" (as our nephew calls it) for a much more sedentary celebration than we had during our drum corps days. Wherever and however you celebrate today, here's some advice -- moleskin still works great to prevent those nasty marching blisters! If there's response, this will become a regular feature of Saints Scribblings. If there isn't, it still may become a regular feature of Saints Scribblings. Prizes! Prizes! We have no prizes! You will, however, be lauded with fame and glory as you receive mention here in Saints Scribblings. Name the twenty three people (as numbered) in the photo below. Send your answers by e-mail to joparente.saintsdrumcorps@gmail.com by 6 am EDT on Monday, July 9. Please use Tuesday Trivia or something similar in the subject line of the e-mail. YOU MUST INCLUDE YOUR NAME IN THE BODY OF THE E-MAIL. If I have to look up one more e-mail address to find your name, I'll ... well, never mind. I'll just say that it's not a good use of my time. You do not have to name all 23 people in the picture. Name as many as you can, and BE SURE TO NUMBER THEM to correspond to the numbers in the picture. It's quality, not quantity, that counts. Only right answers will be counted; there is no penalty for wrong answers. After all, this isn't an entrance exam for college or anything. If you decide to change an answer, multiple submissions are fine -- but only your most recent e-mail will be considered. That means all your answers must be in sequence in the same e-mail. Teamwork is also encouraged -- just make sure to include everyone's name in the e-mail. Thanks to the Fastuca family for submitting the photo to begin with -- it's out on www.saintsdrumcorps.com in Photo Gallery 7, page 6, row 1. We missed a week of Monday MatchUps, but we're back! Karen DeAndrea -- Karen found us! Kathy Prokopiak -- Kathy found us! Maureen Smith -- Maureen found us! A few days ago, brother and sister Michael and Maureen Fastuca graciously agreed to be my first interviewees for Saints Stories -- a subset of Saints Scribblings with more indepth articles.